Feb. 15 - GRAMMY® Award-winning, acclaimed alternative rock pioneers The Smashing Pumpkins today announced the Shiny And Oh So Bright Tour, their first tour in nearly 20 years to feature founding members Billy Corgan, Jimmy Chamberlin, and James Iha. Produced by Live Nation, the 36-city tour will kick off in Glendale, AZ on July 12, 2018 and visit North American arenas throughout the summer. 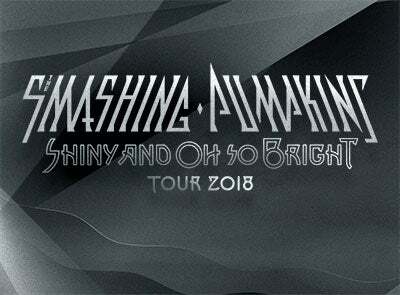 Tickets for the Shiny And Oh So Bright Tour will go on sale to the general public starting Friday, February 23 at 10:00am local time and be available at www.smashingpumpkins.com, LiveNation.com, and via the Live Nation App. “Some 30 years ago, as The Smashing Pumpkins, James Iha and I began a musical journey in the cramped rear bedroom of my Father's house. And so it's magic to me that we're able to coalesce once more around the incredible Jimmy Chamberlin, to celebrate those songs we've made together,” shared Corgan. “This show and staging will be unlike any we've ever done, and will feature a set unlike any we've ever played. For if this is a chance at a new beginning, we plan on ushering it in with a real bang,” added Corgan.